Alzheimer’s disease (AD) results in the deposition of amyloid β (Aβ) peptide into amyloid fibrils and tau into neurofibrillary tangles. Regardless of whether or not these entities are a cause or consequence of the disease process, preventing their accumulation or accelerating their clearance may slow the rate of AD onset. Motoneuronotrophic factor (MNTF) is an endogenous neurotrophin that is specific for the human nervous system, and some of the observed effects of MNTF include motoneuron differentiation, maintenance, survival, and reinnervation of target muscles and organs. GM6 is a six-amino-acid component of MNTF that appears to replicate its activity spectrum. 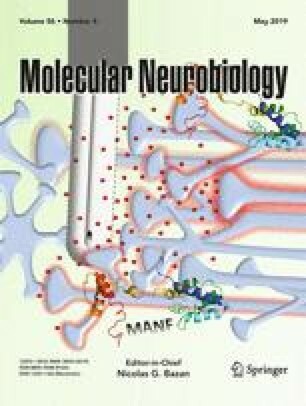 In this study, we investigated the effect of GM6 in a mouse model of AD before the development of amyloid plaques and determined how this treatment affected the accumulation of Aβ peptide and related pathologic changes (e.g., inflammation, nerve growth factor (NGF) expression, cathepsin B, and memory impairment). Application of GM6 over a 4-month period in young APP/ΔPS1 double-transgenic mice resulted in attenuation in Aβ peptide levels, reduction of inflammation and amyloid load, increased cathepsin B expression, and improved spatial orientation. In addition, treatment with GM6 increased brain NGF levels and tempered memory impairment by ∼ 50% at the highest dose. These data suggest that GM6 may modulate disease-determining pathways at an early stage to slow the histological and clinical progression of AD. A correction to this article is available online at https://doi.org/10.1007/s12035-019-1558-6. We would like to thank Winston Ko for his support of the studies. Conceived and designed the experiments: JY, ST, CK, DK, and MSK. Performed the experiments: JY, HZ, ST, WM, and MSK. Performed data analysis: CK and MSK. Contributed reagents/materials/analysis tools: DK. Wrote and contributed to the writing of the manuscript: CK, DK, and MSK. All authors discussed the results and edited the manuscript. This work was partially supported by grants from the National Institutes of Health (R01 ES016774-01, R21AG043718, 1P20GM109091, 2P20GM103444, and 5P30GM103342), VA Merit Award (1I01RX001450-01A1), a grant from the National Science Foundation (IIP-0903795), and an AHA SFRN (15SFDRN25710468) grant (M.S.K.). Dr. Kindy is a Senior Research Career Scientist in the VA. This research was approved by the IACUC of the University of South Florida, following the guidelines for the Care and Use of Laboratory Animals. Dorothy Ko is an employee of Genervon and has interest in the company.